Elettromedia renews its presence at AMICOM 2012, the most important European trade fair for mobile entertainment, communication and navigation technology and is confirmed as one of the main leading innovators in the industry, collecting positive feedback and enthusiastic comments among the visitors. AMICOM is the exhibition of in-car technologies for entertainment, communication and navigation which took place in Leipzig from 2 to 6 June 2012: six unforgettable days for fans and professionals of Car-media and special equipment industry from all over Europe. Elettromedia presented remarkable new products for the car audio market. Already from the earliest statements posted on the social networks regarding the participation to the event, the fans’ questions and expectations were especially focused on the opportunity of actually “touching by hand” the Audison bit Tune, the revolutionary auto-tuning system for the Audison bit processors, with a large array of additional features for the audio system installation and check. To meet these demands, for the whole duration of the event the Audison team has held more trainings on the bit Tune than those originally scheduled due to the growing number of attendees. While inside the booth reserved area the training was taking place, the outdoor area was visited by a crowd of fans, attracted by the products and the displayed democars. 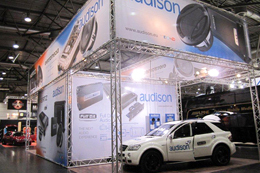 On the one hand there was the Audison area, exhibiting the bit Tune, the Voce line, the bit processors and a Mercedes ML 63 AMG equipped with an Audison Full DA system, realized with the Voce line products, managed by a bit One processor and connected by Connection cables and accessories, including the Connection DA 1 bit Most interface. The other area was completely dedicated to the Hertz products, featuring the newest Dieci.3 line, the HDP amplifiers, the Mille and Hi-Energy comps along with the subwoofer range, the amplified DBA 200.3, the ultra-flat ES F20.5 perfect for customized installations as well as the EBX F25.5 with its ultra-flat box. The audience was won not only by the products, but also by the Hertz democar: an Audi A1 featuring an HSK 163 system, ES F20.5 and HX 250 subs, amplified by an HDP 4 and an HDP 1 and managed by a bit One. The projects of both democars were developed and realized by the specialty centre HIFI Garage, Delitzsch (Germany). Besides the listening sessions and the bit Tune trainings, the Elettromedia booth hosted commercial meetings with its European partners, to finalize business agreements as well as exchange of know-how and ideas on the next projects.